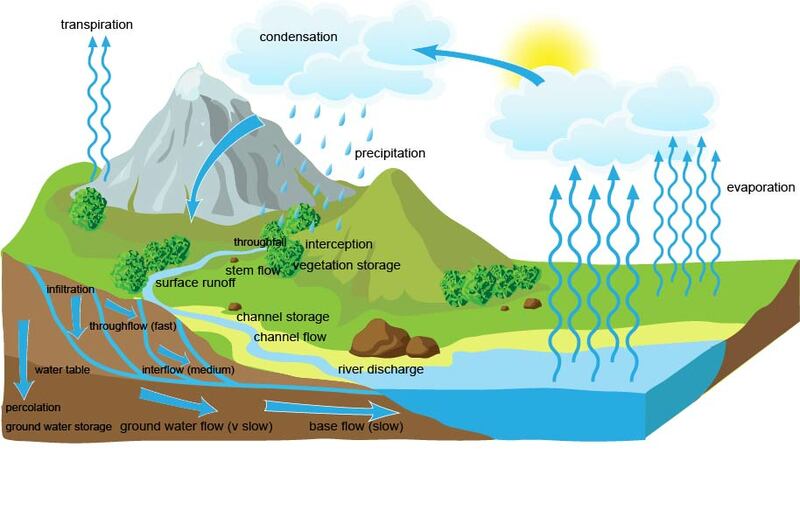 There are a number of distinct processes and pathways of the water cycle that link its main components. Within a drainage basin, the flows of water are summarised using this equation: P = E + Q +/- S or Precipitation = Evapotranspiration + Streamflow +/- Storage. You can find out more about water balance here. Evaporation is the process of water changing from liquid to water vapour. It requires a significant amount of energy to do this. This energy does not heat the water but transfers into latent heat (the heat required to convert a solid into a liquid or vapour, or a liquid into a vapour, without change of temperature). This is then released when condensation occurs. Significant amounts of heat energy are carried into the atmosphere from tropical oceans by the Hadley Cell. The warm air moves north and south of the equator where cooling releases latent heat. As the result of this mid and high latitudes receive energy that makes them warmer than they would be without this. Also, evaporation is important in moving water from oceans and seas to land. Transpiration is the transfer of water vapour from vegetation to the atmosphere. This occurs mostly via pores in leaves known as stomata. 10% of atmospheric water originates from transpiration. Wind speed, availability of water to the plant and air temperature all affect the rate of transpiration at any one time. Rates of transpiration also vary between seasons. Condensation involves water vapour returning to a liquid state. When water vapour reaches dew-point (temperature when the air becomes saturated) water droplets and clouds appear. Closer to the ground fog, mist and dew are examples of condensation. Clouds form when moist air cools. Cooling can occur in a number of ways. The first is by convection. As warm air rises it cools, forming cumulus clouds. Secondly, the air cools when a warm air mass meets a cold air mass. Warm air rises above the cold mass, causing it to cool and form stratus and cirrus clouds. Thirdly, clouds form through advection. This is when a large mass of air moves over a cooler surface, for example, an ocean. The atmosphere is cooled below the dew-point resulting in stratus clouds forming. Finally, orographic uplift also forms clouds. This is when the air is forced to rise over a range of mountains or hills. As the air rises it cools and condensation can occur, forming clouds. Precipitation is any form of water (rain, sleet, snow) that falls from the atmosphere to the land or oceans. In mountainous locations in high latitudes precipitation usually falls as snow. Over time this can either become compressed, forming ice, or melt and flow through the drainage basin. The duration of rainfall affects the speed of transfer through the drainage basin. Long periods of rainfall lead to the soil becoming saturated and an increase in surface runoff. Rain over a short period of time is usually absorbed by soil and vegetation. The intensity of rainfall can also affect the transfer of water through the drainage basin. More intense rainfall typically results in increased surface runoff. In arid regions, such as the Sahel (the sub-Saharan region in Africa), the climate has a wet and dry season. During the dry season, surface storage dries up. During the wet season, there can be localised flooding. Interception is the temporary storage of water on the surface of plants and buildings before it reaches the surface. The rate of interception is determined by the time of year and the type of vegetation. Pine trees intercept more precipitation than oak trees. Buildings are designed to intercept rainfall through roofs. It is then transferred to rivers and streams via guttering and underground pipes. Infiltration is the movement of water into the soil. The type of soil affects the rate of infiltration. Sandy soil has a higher infiltration rate than clay soil. Water is transferred through the soil as throughflow. Water moves through soil under the force of gravity towards rivers and streams. Some water enters rocks below the soil through percolation. Some rocks are impervious an do not let water enter e.g. granite. Permeable rocks can be porous (e.g. chalk and sandstone) in that they allow water to enter their pores. Other permeable rocks are pervious (e.g. limestone) and water flows along joints (verticle cracks) and bedding planes (layers). Where water reaches impermeable bedrock below ground it flows over the surface of the rock. This is known as groundwater flow. When the soil is saturated surface runoff occurs. Also, surface runoff can happen in semi-arid areas where the soil is baked hard. Rainfall is so intense that the soil does not have the capacity to absorb it. 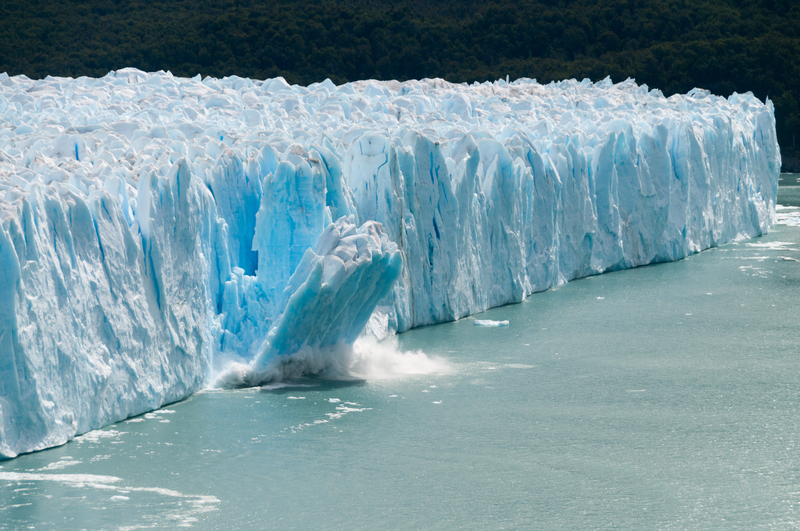 Ablation is the loss of water stored as ice or snow through melting, runoff, evaporation, sublimation, calving of icebergs or the removal of loose snow by wind.